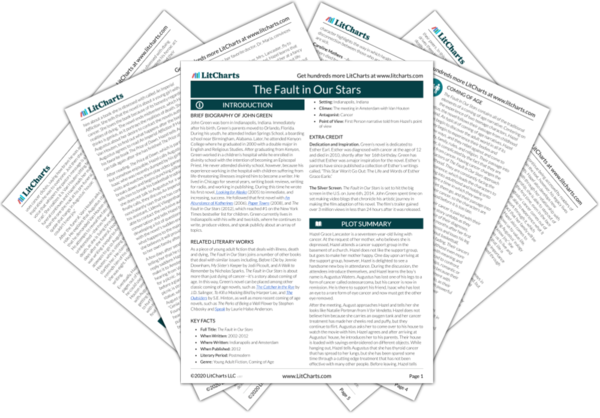 Instant downloads of all 946 LitChart PDFs (including The Fault in Our Stars). 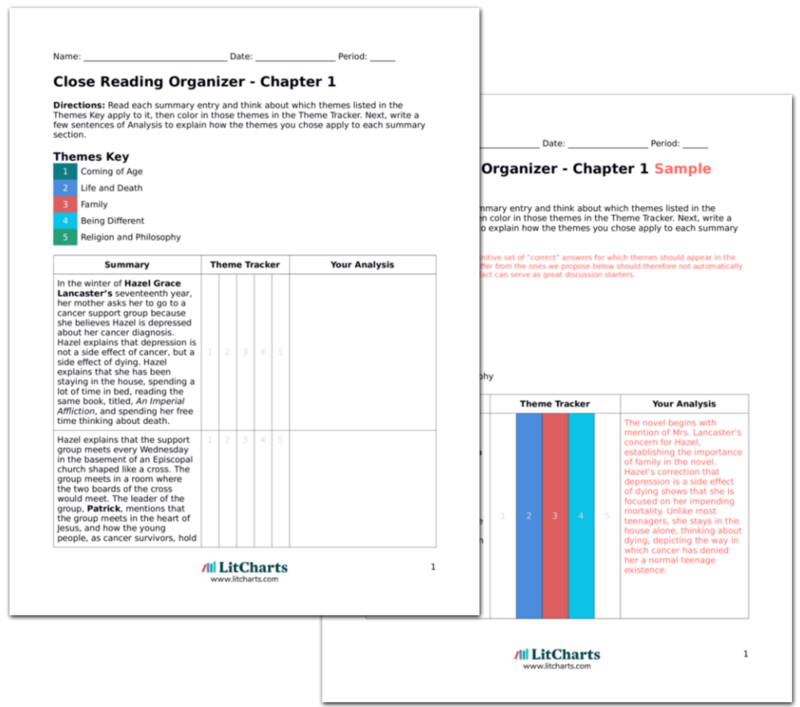 LitCharts assigns a color and icon to each theme in The Fault in Our Stars, which you can use to track the themes throughout the work. When Augustus comes home from the hospital a few days later he is in worse shape than ever. He is taking more pain medication and he must sleep upstairs in a hospital bed by the living room window. One day while Hazel is with him, he points to the laundry basket and tells her that he can see his “last shred of dignity” beside it. At this point, Augustus has lost all self-sufficiency. His comment about his dignity shows that he is aware of the loss. By walking right in, Hazel shows that she has become an accepted part of the family. The kids descriptions of her point out both her difference and her status as Augustus's girlfriend. The boy's comment about Augustus dying suggests that in words he understands what's happening, but for his young mind the reality of it is still an abstraction. When she enters the living room, she finds the family sitting with Augustus. His sisters hug Hazel. One of his sisters is sitting beside Augustus talking to him as if he were an infant. Hazel says, “What’s up, Augustus?” trying to model the appropriate way to talk to him. Augustus’ sister treats him differently now that he is sick. Hazel dislikes this action because it suggests that the illness makes him fundamentally different as a person, instead of him being the same person who happens to be sick. After a while, Augustus wakes up and asks if they can go outside. His family kneels around him, barraging him with compliments and questions. When one of his sisters tells Augustus how smart he is, Hazel says that he’s not smart; he’s just good looking. They go back and forth, joking about Augustus’ looks and how he literally took Hazel’s breath away. Augustus’ dad eventually says enough joking, but immediately puts his arm around Hazel and kisses her head. He tells her that he thanks God every day for her. The family continues to treat Augustus differently based on his cancer. Hazel pushes back by joking that Augustus is not good looking, showing the way in which it is alright to joke with a sick person. Augustus’ dad’s gesture shows Hazel that the family accepts her as one of their own. Augustus' father's faith in God has not been shaken by Augustus' relapse. While Hazel doesn't share his belief, she can share his love for his son and accept his love for her. Powers, Jacob. "The Fault in Our Stars Chapter 19." LitCharts. LitCharts LLC, 16 Apr 2014. Web. 25 Apr 2019. Powers, Jacob. "The Fault in Our Stars Chapter 19." LitCharts LLC, April 16, 2014. 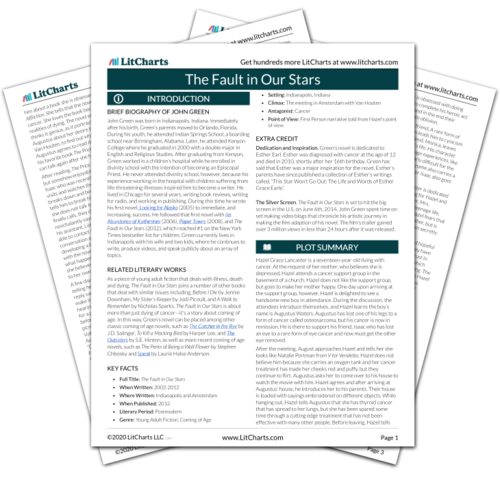 Retrieved April 25, 2019. https://www.litcharts.com/lit/the-fault-in-our-stars/chapter-19.